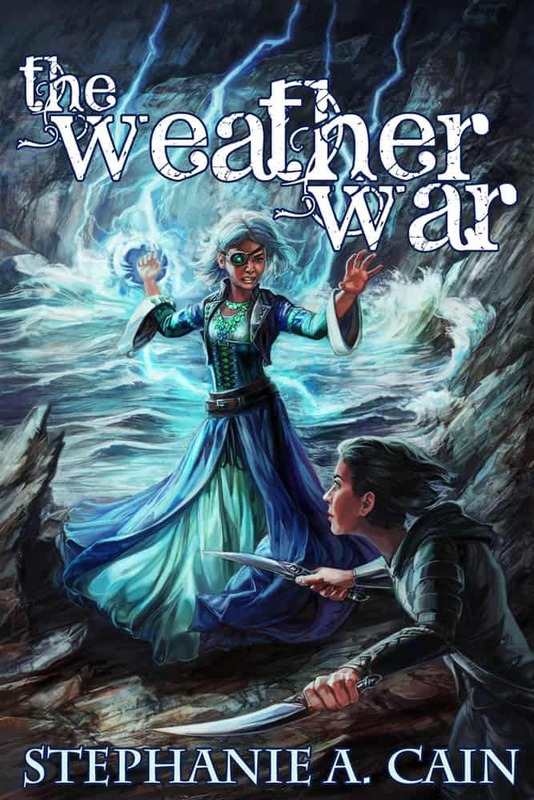 I’m so excited to show you the awesome cover Nicole Cardiff created for The Weather War! I am in love with this cover. I have it as the wallpaper on both of my computers (even the one I don’t write on) because it’s so perfect. The figures on the cover are Princess Azmei Corrone (with the daggers) and a new character, Eldry Karayan–a stormwitch. Before I post the cover, though, I’m going to give you the blurb and buy links, because guess what–it has a release date too! It’s currently available for pre-order at $0.99 (it’ll be $3.99 after it releases) and it will be available September 19! Just in time for Talk Like a Pirate Day, savvy? Ready for the cover? Here it is! So what do you think? Isn’t it perfect?! Azmei, cover art, Nicole Cardiff, The Weather War. Bookmark.